Soul Hatching Meditation Check out my New Year’s Miracle! Alma had exhausted all her money and resources trying to find a way to share her poetry with the world without becoming a starving artist. I am sick and tired of working two and three jobs while keeping poetry as a hobby. Writing at night exhausts me. I begin my long working day tired and frustrated. But what could I do? Publishers say that poetry does not sell, and I don’t have the money to publish and promote myself. Plus everyone wants poetry to be free, and I can’t live just from the few books sold. The math doesn’t add up. If I could become a great poet, like Maya Angelou or Pablo Neruda. Or maybe a famous performer like Lady Gaga… then perhaps my poetry would inspire millions and I will be able to earn my living from my passion and purpose. Lost in these thoughts, Alma found herself in a strange vicinity. She was smiling at the last thought of being like Lady Gaga, finding it as outrageous as impossible, when she realized that she had never been in this spot. She looked around at the trees. They seem familiar, glowing with golden or yellow-green leaves against the autumn sky. Yet, she had never seen these particular trees, align as in a circle, with the terrain to her right slightly elevated and a cliff to the left at the bottom of which a narrow stream skipped through smooth pebbles. On the hill to her right rose twelve very old stone steps that seemed to have formed organically, without any intervention from human hands. At the top of the steps, she could see a stone arch with some strange inscription that was barely visible. She looked at her watch, but it indicated that she had been walking for 20 minutes of her usual 30 half-hour daily walk. Just then a pile of dried leaves moved and an old raggedy woman emerged from it. “There’s a beautiful Swan swimming in the lake, do you want to see it?” she said with a toothless grin. Alma loved swans, and they were not such a common sight in these suburbs, so she eagerly agreed, though her mind was cautioning her not to go. “It could be a trap. There could be a psycho-killer working with this lady. It could be dangerous,” warnings crossed her mind. “I’ll show you for a quarter,” the lady said, showing even more of her gums. “You see? It’s a con job,” her mind warned. But something stirred deep in Alma’s body. Her heart was skipping ahead and she followed. Alma took a quarter and gave it to the lady, who pointed the way up the stairs. Alma climbed the stairs, with the old woman walking behind her in a rustle of dry leaves. “Go up. That’s it. It’s safe. Just one more step. Now cross the threshold and you’ll be almost there,” the old lady kept coaching. Alma reached the threshold and tried to read the words embedded in the stone arch, but they were too faded. Alma thought of rejecting the stick. The old lady had more used of it than she did. But she did not want to offend the lady, which seemed very sure that it was a valuable gift. “Perhaps this is all she has to give and if I reject it, she will feel offended,” Alma thought. “Thanks. A stick is very helpful during a walk,” she said gratefully, hoping to convey importance so that her companion would know that her gift was appreciated. But she decided that the lady had no education and was trying to describe something that is close but not too close. That meant that the lake was probably down the hill, but not immediately visible. With that assurance, Alma crossed the threshold. When she looked back, there was no one there. The old lady had disappeared. This did not really scared Alma. She expected no true help from the old batty woman. She had given the quarter as alms, not payment. Alma walked down the hill. She looked at the beautiful oaks that formed another arch and decided to walk straight ahead between them. The lake was probably straight ahead. “Ahgrr!” she screamed as she got entangled in a giant spider web. Alma struggled with the strong silver threads, and her mind began to race. Alma knew that if she did not stop her mind, it would go on and on with warnings, explanations and recommendations. She could understand how sensible these warnings were, but there was something ahead. It was there. She could feel it. As soon as Alma shifted her attention from her mental warnings to the presence in the lake, she felt the fresh presence of water and heard a subtle streaming sound. She used the stick to break the spider web and was brushing her jacket when a great brouhaha of wings and cries made her jump. A Shadow crossed her path and Alma jumped back. A black bird jump from the branches of one of the trees, cawing and calling with such urgency that Alma feared it was an omen. But even as her heart jumped from fright, Alma heard a whisper. It was far and barely audible, yet it was there, like the soft fluttering of feathers or the song of the stream over the pebbles. She moved as in a trance, seeking the tiny whisper, when she heard shuffling ahead. She bumped into a make-shift door with a string of grey feathers as a curtain. As she moved the strings aside, she saw a small girl right in front of her. The girl was seating on an old rusty metal cracker box and had a duck on her lap. She was plugging the poor duck without any qualms. “It’s not a swan, you silly, it’s a duck!” the girl said as she cruelly plugged a feather from the duck, who squawked loudly. “It’s just a stupid ugly duck!” the girl screamed as she stood up, holding the duck by the neck. “Stop it, you are going to strangle the poor animal,” Alma scolded. Something deep in Alma’s heart broke with a loud noise, like the chord of a violin snapping. Alma recognized this girl. She recognized these words. She had healed enough and knew her pain enough. The child let go of the duck, who flew away, and ran towards Alma’s arms. When Alma embraced the child, she disappeared. Now Alma became very quiet and attentive. She understood that she was on a quest. She understood that a magical portal had opened and that this was the answer to her plea. The whisper grew closer. She could almost hear a voice in the wind, beaconing her. As she moved towards the voice, a beautiful poppy field appeared in the middle of the trees. The poppies were read and orange, golden and blue, purple and white. They pop up right in front of her, growing among the naked trees, the evergreen pines and the oaks with their golden leaves falling into the soil below. “And what a big distraction,” she finished. Not for nothing had she healed her addictions. She had stopped overeating and smoking. She had stopped seeking solace in bad relationships. She recognized delusions and distractions and she knew the reason for their existence. The minute Alma said this, the girl and the poppies disappeared. “I think I’m getting the hang of this journey,” Alma laughed as she walked straight ahead. The noise rose as the wind increased. And then Alma bumped into the source of the noise, a big log hung over two vertical logs with strings of arrows. Beautiful painted arrows adorned with feathers. Who made arrows around these parts? Arrows flying everywhere. Shadows behind the trees, shooting arrows . “They will kill the swan!” Alma thought and ran after the Shadows. As she was catching up with that Shadow, she saw two more shooting from adjacent trees. Just then she understood. The problem was the solution. The hunters made her think that the swan was the prey, but it was she who was the prey. If she hunted them, she would fall right into their trap. It was hard to leave them shooting arrows, fearing that any of those arrows could kill the swan. But in her heart Alma knew that they could not kill the swan. Their true purpose was to engage her in fixing the problem they had created. A part of Alma felt compelled to protect the swan. But a wiser part of her, the part that could hear the whisper, walked away. Alma took a step forward and found herself inside a circle of stones that looked like a ceremonial site. “How did I step inside this circle? I didn’t see it before,” Alma remarked. Just then she saw a woman pouring corn on the stones. The woman turned around and saw her. Alma walked towards the woman, her hands outstretched. The woman’s plea had touched something in her, some deep hunger. The sense that something had to be done to save or nurture her soul, but there was no time. “I am here. I am real. I need help!” the woman cried out as Alma lowered her arms. Nothing until that moment had challenged her as this plea did. Her arms stretched out to this woman. Her heart stretched out to her need. And at that moment, when her heart seemed split into two, Alma recognized the trickery. “This is my own hunger for the swan projected outside me so that I betray my quest for the swan,” Alma whispered. The woman became a Shadow and the Shadow disappeared as the sun aligned itself high above. Alma felt thirsty, but she did not have a water bottle. After all, she had just gone out for her daily walk and drank water before she left. The thirst became unbearable. “It’s twelve o’clock already,” she thought. “I’m hungry. She scratched her nose and then she felt the urgent need to go to the toilet. “Jajajajajajaja!” Alma laughed. “You found no place to distract me with my mind, so now you want to distract me with my body! “Here’s my answer!” Alma said out loud. “I will drink water from the lake when I meet my swan. I can scratch my nose as I walk towards the swan. I am not really hungry and there’s plenty of food in my house, as I will not die for waiting a couple of hours more. Finally, I can wait to go to the toilet, and if I get a stronger urgency, I will still keep going. Nothing will distract me from finding the lake and meeting the swan. Nothing! She scratched her nose as she moved ahead and all the other physical discomforts immediately went away. The smell of fresh water inundated her senses. The peaceful stream of sweet water trickled into her ears, and just as Alma saw the lake behind the oak trees, a terrible fear rose within her. There was such a pristine silence surrounding the lake that Alma could hear the song inside the silence. The lake stood in a clearance where nothing perturbed its purity. Noises stopped. Not even a bird was heard. STOP! Don’t move! The swan will flee at my site! It will be afraid of me. I will never see that swan if I move towards it. It is not there. Nothing is there. The swan is not there. There is only emptiness. I am disappearing. Her stomach turned into a knot. She wanted to run. Her vision blurred. Alma closed her eyes and dropped all her attention into her heart. She embraced the silence. She dived into the emptiness. She abandoned all need to control and allowed her heart to guide her steps. Her fear dissolved and a sense of great freedom enveloped her. Walking with her eyes closed was not scary now. She was seeing with the eyes of the Swan. She fell and rolled down a small hill and as she rolled she was in ecstasy. Her mind cracked opened and a flush of revelations flooded her senses. Was the Swan speaking to her? It was beautiful! You are descending into your Sacred Self. “I must write this poem,” Alma thought. “Let the poem write you,” a soft whisper told her. This was the voice of the Swan. Alma realized that even the revelations and poems flooding through her were still veils of deception and distraction that could steal the swan from her. 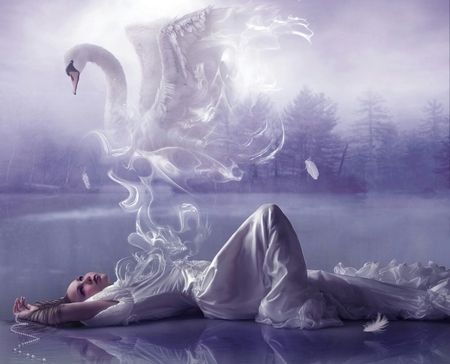 Alma got up and opened her eyes and just as she thought that she saw the swan, a great sleep came over her. She felt as if she was drugged or under anesthesia. Her eyes closed and she staggered. There was only one thing to do. Alma walked into the cold water and did a full dive. Her body woke up in total awareness and she emerged laughing. The water was so pure that it reflected the trees around it. She looked down and saw the sky. Her imagination was enhanced and supercharged. The world was an ocean of metaphors. Alma needed pen and paper to capture the flight. “Do not attempt to capture my flight or you will be left behind. Seek my freedom, not my possession,” Swan spoke into her heart. Alma shook her whole body and a shower of transparent drops shimmered in the mid-day life. Just then a distant clock stroke one o’clock. The whole morning had gone by and still the swan was not in sight. Alma felt a surge of frustration, impatience and even anger at the swan for enchanting her and wasting her time. “You are so close!” Swan spoke into her heart. “Don’t give up now. Be brave. Dive deeper. She dove into the cold water. Her body shivered violently, but it was not from the cold. Her skin, her muscles, her bones; all her physical being was shapeshifting. She was becoming something else. Feathers sprung from her pores. Her neck unfurled and she felt the graceful long neck of the swan connecting her body to her head. Her eyes were large and saw beauty. Her small tail directed her easily, without effort. There was music inside her, a heavenly music that flowed inside a vibrating silence. She was poet. She was the poetry. She was metaphor. She was life unfolding. She was the world speaking to herself. She was the language of soul, of body, of nature, of Divinity uttered through her lips as a drop splashes from the ocean. She opened her long golden beak and star dust spread from her tongue, the dust of supernovas, the dust of our origins. This dust was the food for our soul, for our spirit. It was as urgent as the food on a table. It was the only language the soul recognized and it guided the soul back home to itself and guided the consciousness back home to the soul. Her poetry was like this journey to the swan. She was the swan. And the Song of the Swan was its beauty, its call to each person to connect to Soul. That was her task as a poet. It was an essential task that would connect humans not only to their Soul, but to Divine Source, and not only to Source, but to Earth. Her poetry was the breadcrumbs that takes the Children of Gaea back to the mother and the Children of the Stars back to the Universe. An arrow stroke the swan and she spiraled down, down, into the bottom of the lake. The swan descended, blood pouring from its heart. And as the swan hit the bottom of the lake, Alma screamed. “NOOOO! I will feel this pain. I will be vulnerable, because my Soul is able to feel my loss as a path to love. The Soul does not die from pain. The Soul does not crack from pain. I am not the lack. I am not the labels others have called me. I am not the fear or the hunger. I am Swan. I rise. Thus, Alma pushed up and began to rise and as Swan’s body rose, it shook violently. But Alma knew that these tremors were restoring her being, so she surrendered. Swan emerged from the waters in a majestic swoop and took flight into the light. For the Soul Hatching Meditation that allows you to do this journey with Alma, click here. For the understanding of the 12 Veils of Forgetfulness that Alma crossed in the story, click here. If you liked this story, I would love if you leave me a comment. If you like this Quest Story, you are probably have the gifts of the seeker, quester, dreamer, healer, alchemist, huntress or warrioress. Storytelling is your path to transformation. Join my Story Lovers Club to find more stories like this, to quest through them with my guidance and to fill your life with inspiration and wonder. 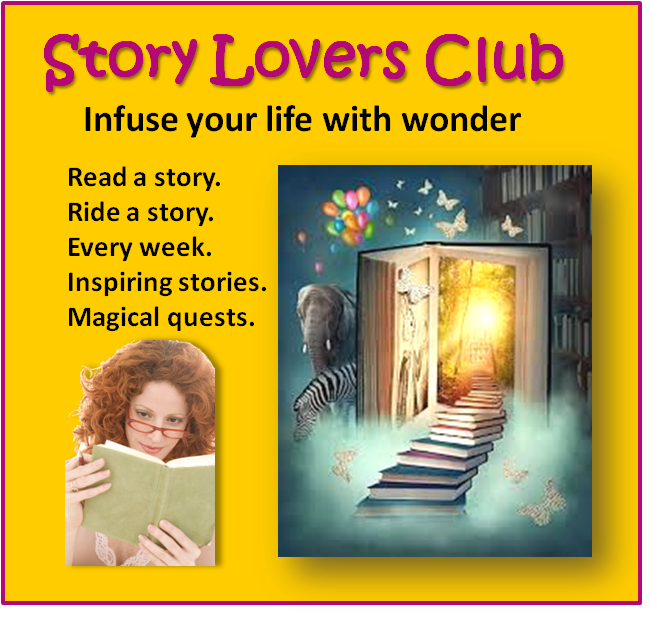 Join my Story Lovers Club.